All ties are a Limited Edition of 300, hand signed, highest quality digitally-printed reproductions of Adam Konigsberg original designs. This 19mm Charmeuse tie is hand made with hand-rolled bar tacks. 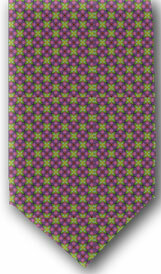 The tie is 7-fold and made only with silk, including the lining. The tie is standard length and width (3-1/2″ at its widest point). There will be an extra charge for Big and Tall sizes.